While texting is a powerful way to engage prospective and current students, there are right and wrong ways to do it. Here are some tips for effective SMS texting. Because your text will display as an unknown sender, you need to identify yourself as a human and establish a rapport with your students. A student is much more likely to engage with a person than a message. When you address students directly, you show that they are not just another number in a large group. Using a student’s name also eliminates confusion and shows that your text is indeed intended for them. If you come across as too personal or lackadaisical, it can confuse someone and make it difficult to build trust. On the same hand, a formal, stoic tone can be very off-putting and unfriendly. Be professional, but human with your messages. Text like you would talk. Don’t be afraid to use emotion, especially if you’re sharing good news. Be personal, concise, and relevant so the student knows they’re dealing with a human being. This tip is very important. Students want information, and the best way to increase engagement is to ensure that they’re getting as much as possible. If you’re texting an event reminder, ask if they plan to attend. If you’re sending along an invitation to an open house, ask if they know where to park. Make yourself available to them and build a rapport. Texting is personal. 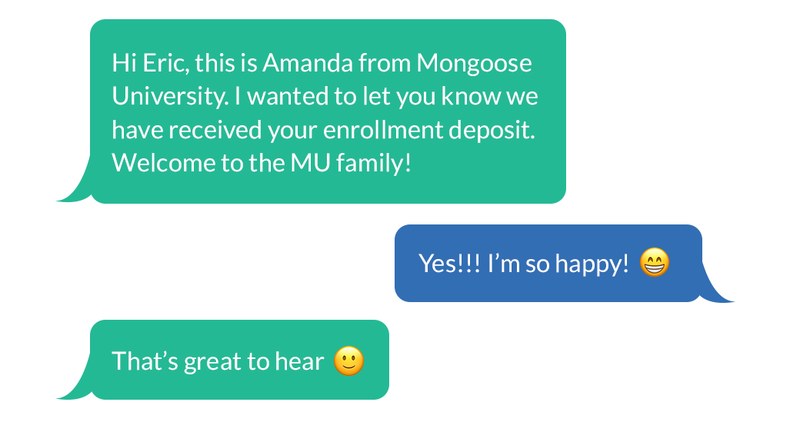 While 80% of students want to receive texts from colleges, they do not want what they perceive as spam. (Hint: if they don’t want the message, it’s spam.) Avoid holiday greetings and focus on important information that is helpful to students. Don’t give them a reason to ignore your next text. Get your department involved in the strategy to ensure buy-in across the board. You’re sending a text, not a letter. Make sure your text has all of the pertinent information you wish to convey, but eliminate anything you don’t need. The key is to add personal touch without invading a student’s personal space. An attempt at humor might seem like a great idea, but a funny gif might not resonate with everyone. Think of it as a numbers game where the risk is greater than the reward, even if your intentions are good. You’ve developed a plan to build trust with your students, the last thing you want to do is to violate that trust by disappearing. If you’ve sent a text that asks if they want more information and they reply with a question, you’ll damage your credibility by not getting back to them in a prompt manner. Have fun – show your excitement! This is the most important time in your students’ lives, and you’re a part of it. Don’t be afraid to show emotion if the situation calls for it. If a student shares an emoji with you, that’s a green light to send one back! Is this valuable information for the students?